* Mommy dragged me to MORE ultimate frisbee games. She must really love Daddy or something, because whew it was hot! I was super duper cranky at Mommy for a while until she gave me some gas drops. Man that stuff is delicious. I would eat it all the time if Mommy let me. * On the second frisbee day Mommy decided to take me to the pool to cool off, so she got me all dressed up in my swim diaper, swimsuit, and swim shirt. She gunked me all up with sunscreen, too. On the way to the pool I decided I needed a nap, so I slept while she went in the pool with Ellie and Ellie's mommy and Ellie's Aunt Jessica and Uncle Jeff. Well my Mommy should have thought things through a bit more. She let me nap in my swim diaper. Silly Mommy. Of course I had to go potty while I was sleeping...I always go potty while I'm sleeping. And guess what. Swim diapers don't hold pee. 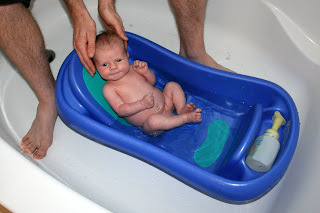 Otherwise the diaper would get all swollen and heavy in the pool and all us babies would just sink to the bottom! So when Mommy took me out of my carseat after I woke up, I was completely soaked in pee. Even all the way up my back. She had to put a towel in the bottom of the carseat to take me home so I didn't have to sit in a pee puddle. It was so icky. Thankfully she learned her lesson and she doesn't leave me sitting around in my swim diaper anymore. * Mommy and I started playing Patty Cake together, and it's such a fun game! I like opening my hands when she does it so that it's almost like I'm clapping. She thinks it's really cute. (Of course.) Someday I'll clap on my own, but I'm gonna make her work a little harder before I do that. * Oh yeah, and the big event of the week of course was that Mommy went back to work. Holy cow she cried a lot. I kept telling her it would be ok, but she was really sad anyways. While she's at work, I go and hang out at Eileen's house. Eileen is awesome. She burps me four times during each feeding just so I don't get too gassy or spit up too much. And she plays with me lots. There's other babies there for me to play with, too, once I can actually play (man this growing up stuff takes a long time!). I'm always happy and smiley when Mommy comes to pick me up so that she knows she doesn't need to be sad. I think it's starting to work, cuz I haven't seen her cry in a while. Thank goodness. Sleeping next to my friend, Ellie. We do lots of stuff together. Me and Ellie with our mommies. Ellie really likes holding my hand, and usually I decide that's ok.
Mommy dresses me like a stud sometimes. She even bought me flip flops. She's a pretty cool mommy. * I turned 3 months old on June 5th! Yay!! I'm getting super old these days. It's pretty impressive. * Daddy and Mommy and me went to Charlotte for Daddy's cousin Hannah's bridal shower. It was fun. Lots and lots of people held me. Cousins, aunt, uncles, grandmas and grandpas, even a great grandma and grandpa I hadn't met yet. And of course Mommy and Daddy. So many people held me that daycare Eileen noticed that all I wanted on Monday at daycare was to be held. She told Mommy not to hold me all the time and that I'm fine playing on the ground or in the playpen. Mommy already knows this, but I keep hoping she'll forget. But now she's never going to forget if Eileen keeps reminding her. Sheesh. I need to have a talk with Eileen. * I started holding my head up a little more when I'm on my belly. Screaming apparently wasn't working, so now I'm going to try giving Mommy what she wants sometimes to see if she'll cut it out with all the tummy time. It hasn't worked yet. * My new favorite thing is my legs and feet. I like laying on my back and pulling them up close to my face to hold and play with. They are just so awesome. And they're always there to play with! It's simply wonderful. * I almost rolled onto my belly from my back. Lots of times. I get all the way over except this one arm keeps getting stuck under me. Not that I really want to be on my belly. I'd rather stay on my side. But I'll probably roll all the way over sometime soon just cuz it's the cool thing to do. Holding my head up to check out this stud in the mirror. With cousin Hannah at her shower. Legs and feet are the best toys ever. I'm a man of many expressions. Check out this move!! Yup, the ladies are gonna come a runnin'! In the tub, now and at 3 weeks. I was so itty bitty back then! so cute Kara! Love reading how he's growing and developing! Love the bath pics! It's crazy how fast they grow up! you need to have a word with your mommy because she doesn't get what the spitting up business is about. either that, or she likes it. =p when we were your age, we had to sleep on our tummies. i have no idea how we did that. you babies nowadays don't seem to like that.